Discover a Locally Grown Coffee, Here In Byron Bay. 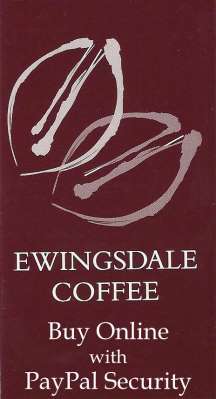 What are the ingredients that makes Ewingsdale Coffee so good ? We adhere to the traditional methods of coffee growing and processing. We choose not spray our plantation with any pesticides or herbicides, that not only benefits our coffee trees, but is in harmony with our holistic approach to farming. Our climate in Byron Bay makes growing coffee here productive. At Ewingsdale Coffee Estate – Byron Bay, we hand pick the fruit. Only the ripe cherries are chosen. We don’t mind waiting and letting nature take its course to ripen our coffee.This waiting may extend our harvest season, but it means we can revisit our trees time and time again and hand select the choicest fruit. Using a ‘wet’ process we pulp our cherries and our coffee beans are fermented in rain water before being sun dried. Why use diesel powered drying machines when the sun provides us with a perfect way to dry our beans, helping to reduce our ‘footprint’ on this precious planet. Before roasting, we keep our coffee beans in their own parchment for at least twelve months. This helps to achieve maximum flavour. It also protects the coffee beans from moisture and unwanted odours. The coffee beans are master roasted locally in Byron Bay, on a weekly basis. This ensures our Australian coffee is always fresh. Our coffee has a distinctive mellow taste and a rich nutty aroma and you avoid experiencing that bitter after taste other coffee can give you. Our coffee sachets contain a zip fastener and a one way valve, and are heat sealed when packaged. You receive your coffee within days of roasting and our packaging keeps your coffee fresh to the last bean. Ewingsdale’s coffee estate growing and processing methods help to make it one of Byron Bay’s finest hand crafted coffee, and it’s 100% Australia grown and owned. ‘You can taste the sunlight , the clean ocean air, the rain and the love in every bean’. When you choose to buy Ewingsdale Coffee, you are supporting Australian agriculture. Thank you. You can have our coffee delivered to you, anywhere in Australia via our online store.